John Grossi with his daughters at his spinathon for Mass General Cancer Center. From left, Nicole DeRosa, John and Jolene Grossi-Hogg. Through an 18-hour spinning event at one of his sports clubs, John Grossi, his employees and club members raised money to support research at Mass General. Ten years after a diagnosis of non-Hodgkin’s lymphoma, John Grossi is grateful for the care he has received from Ronald Wayne Takvorian, MD, and Massachusetts General Hospital Cancer Center. Those words echo in John’s ears today when he thinks about how lucky he is to be healthy. The owner of Latitude Sports Clubs on the North Shore held a 2017 fundraiser at his Salisbury location and raised $80,000 for lymphoma research at the cancer center. Mass General Cancer Center is one of the leading cancer care providers in the country. Through its foundation in evidence-based research, the center offers patients innovative treatments and care. In 2008, when John was busy building his largest gym in Peabody, Mass., he noticed that his tonsils looked extremely swollen. After a referral, he found himself at Mass General Cancer Center with a diagnosis of non-Hodgkin’s lymphoma. Lymphoma, an uncommon cancer, begins in white blood cells, which are part of the body’s immune system. John was diagnosed with mantle cell, a type of lymphoma where survival rates are improving due to better care and treatments. But he was impressed by Dr. Takvorian, who sees himself as someone who troubleshoots his patients’ medical concerns and gives them honest and kind guidance. Most of the time during his months of chemo, John felt well enough to ignore his cancer, exercise and play basketball. He operated his fitness clubs and spent time with his wife, JoAnn, and family. His son-in-law drove him to chemotherapy. Following chemotherapy, John underwent a stem cell transplant as a second way to attack the disease. The procedure went well. Doctors told John he might be in the hospital for 30 days. He went home after 19. When the cancer returned as a small mass in John’s cheek, doctors used radiation to clear it. 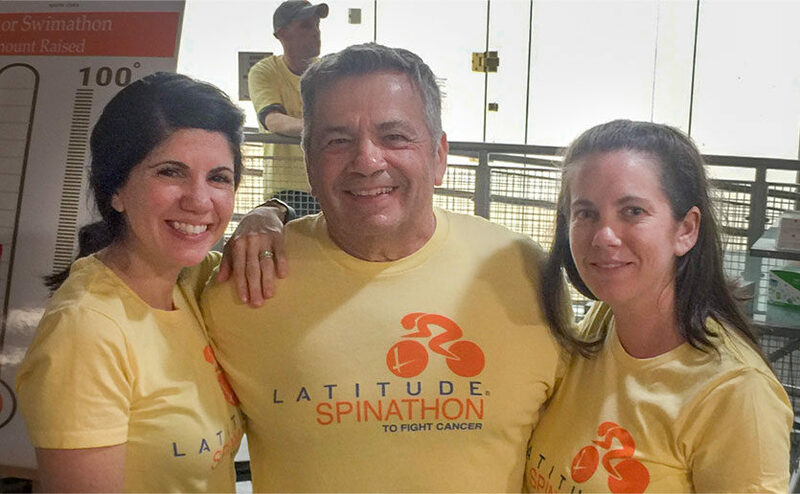 During the 2017 spinathon, more than 250 riders rotated on more than 40 bicycles for 18 hours. Some pedaled the entire time. Organizers promoted the event with social media, email, magazine ads and radio spots. The spinathon featured an auction and a raffle with more than 100 items donated by the community. Former members of the Boston Bruins such as Terry O’Reilly, Rick Middleton, Ken Hodge, Jr., John Carter, Kenny Linseman and Cleon Daskalakis stopped by and live bands played through the night. John says he was pleased with the outcome and happy to give back to Mass General where the doctors, nurses and specialists made it as easy as possible for him during his treatment for lymphoma. To make a donation to support the patient care and research of Dr. Takvorian, please contact us.